Bicycle Repairs, Ski & Snowboard Tuning, Indoor Training Classes, Bicycle Maintenance Classes, Bicycle Accesories, Bike Rentals, Shop Cycling Team, Group Rides, and more! We started as Bethany Bike Repair, Portland's smallest bike shop located in Bethany Village. 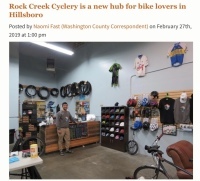 Now, we are Rock Creek Cyclery, serving the greater Rock Creek area with bike repairs, classes, ski & snowboard tuning. We are focused on growing the local cycling community through offering group rides, helping beginner cyclists get comfortable on the road, and helping advanced cyclists break into racing. Stop by the shop to learn more! Conveniently located between Orenco Station and Tanasbourne.